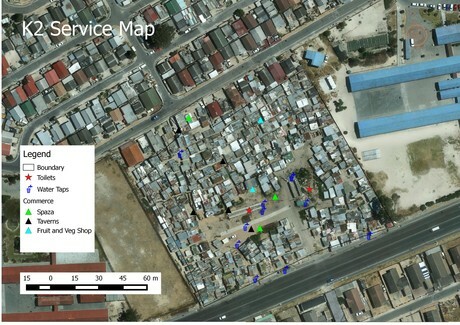 During a very successful learning exchange focused around settlement level data visualisation and mapping, community members from K2 and Green Park, two informal settlements in Cape Town, created digital maps of their neighbourhoods. Siyaunya puts his head over the GPS device and enters the code for water tap, WT 001. Next he records the geographic coordinates of the location: -34.0289, 18.6731. He and his team repeat this process for every water tap and toilet in K2, the informal settlement in Khayelitsha that Siyaunya calls home. Different codes are used for each type of facility and with regards to their functional status. A broken toilet, for example, gets an N added to its code. These codes together with the coordinates form the raw data for the maps. Apart from the team mapping the basic services there are two other teams on the go to map the settlement boundaries and other interesting features like shops, taverns, and restaurants. Each of the three teams consists of community members, Informal Settlement Network (ISN) and Federation of the Urban Poor (FEDUP) members from across South Africa, and SDI federation members from India, Uganda and Ghana. The latter travelled to Cape Town to support the South African SDI Alliance in refining their digital mapping skills – skills that will help take SDI’s community mapping process to another level, making it easier and quicker, and increasing impact. 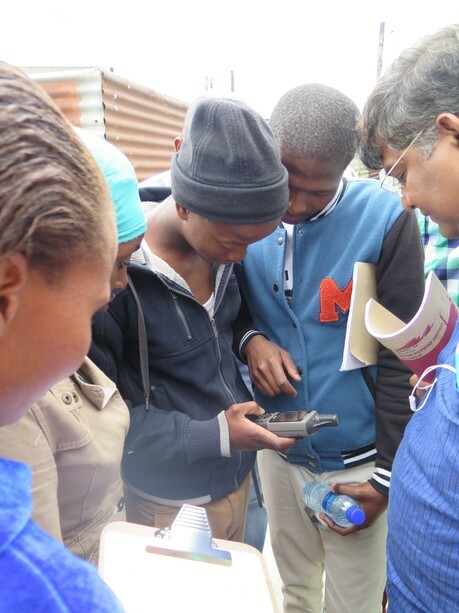 Through a hands-on, learning-by-doing approach Siyaunya and his fellow community members, most holding a GPS device for the first time that day, used these devices with confidence by the end of the day. They also understand that the need to stand next to the service or feature you are mapping is about more than getting an accurate reading on the GPS device. It is about the process of gaining intimate knowledge and understanding of one’s settlement and being able to share this knowledge with authority. A geographic profile of the settlement consisting of the boundaries and the basic services, at a minimum, is a crucial part of the standardised profile. It is not enough to know the number of toilets – one also has to know their spatial distribution. 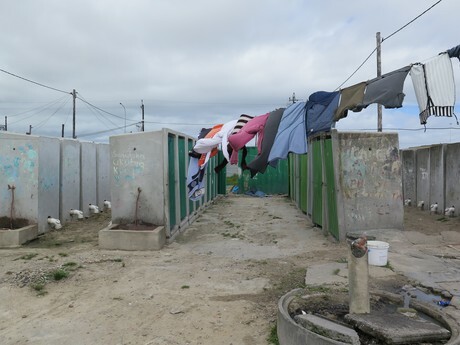 If all the toilets of a settlement are located on one corner, the numbers alone are a bad indicator for the reality a woman from the other end of the settlement experiences when going to the toilet at night. The spatial dimension adds value to the data and is highly relevant for planning upgrading projects. To put it in a nutshell: Numbers are good – but maps make the numbers come alive. In addition to that John Samuel, from NSDF/SPARC India and part of the data team at SDI, points out that maps are more intuitive to understand than plain numbers and respond better to the variable literacy level of slum dwellers. She was part of the team that profiled and mapped 62 settlements in the city of Kampala. The comprehensive report with the maps generated was handed over to the Kampala City Authority in September this year and is a good example how the data can be used to drive communities’ dialogues with government for slum upgrading and development at the city-wide scale. 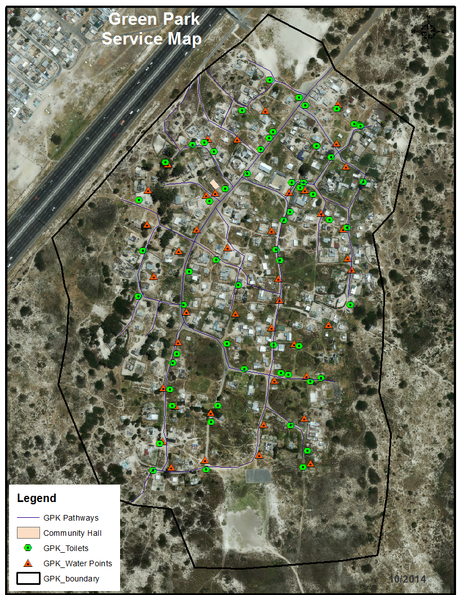 The profiling and mapping of settlements is a powerful tool for promoting active citizenship in communities of the urban poor. SDI’s focus for the coming years will be to routinize and consolidate the learning around city-wide profiling and mapping for the cities it works with. Concretely, the idea of going city-wide is to push the federations to think beyond their existing network so as to include the voices of other settlements in the city, meet new leaders and together create concrete alternative plans with which they can begin to talk to their cities. Community mobilisation and mobilising city-wide federations are then also among the first goals Celine D’Cruz, SDI co-ordinator anchoring and supporting the data collection process for the SDI network, mentions when she talks about the Know Your City process. It is about the creation of a momentum of inclusion and of identity making for the community of the urban poor. 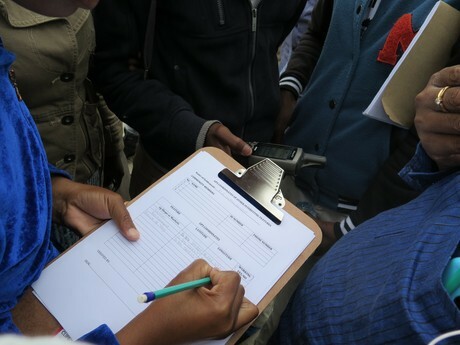 Furthermore, the data collected supports the development of alternative participatory plans for slum upgrading strategies based on prioritised needs; it offers federations and communities at large the ability to monitor their own settlements and, last but not least, grounded and consolidated data at the local level, once aggregated, opens up the space for advocacy at the national and global level. The maps of K2 and Green Park were visualised the same weekend and brought back to the respective settlements. They are as different as the settlements themselves are. Spread out Green Park contrasts with dense K2. In the latter, all the toilets are located on one site, leading to a situation mentioned above, where a map paints a clearer picture of reality then just numbers. The learning exchange made clear that settlement profiling and mapping is an essential tool to leverage upgrading, monitor settlements and for regional and global advocacy. The young leaders from K2 and Green Park definitely seemed eager to continue the work and make the realities and needs of the city’s urban poor majority visible through maps.